I just noticed that it was no longer sunny outside. 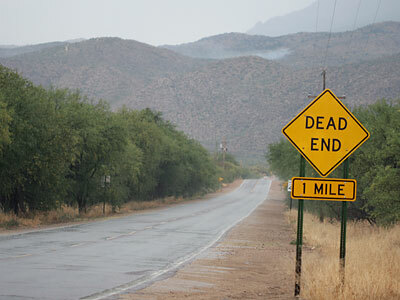 The sky has blackened and the wind is roaring down from the Rincon Mountains in the East, but there is no real rain yet. We're getting hit by the outflow from a large, early thunderstorm. Because these early thunderstorms often have little rain, they pose a great fire danger for the mountains due to lightning strikes. Many of the serious forest fires here have started in May or June, before the summer monsoons of July. Update: It is now raining and the temperature has dropped to 71 °F (21.7 °C). The storm did start a fire above Tanque Verde Guest Ranch, but it appears to be very small. It can barely be seen in the photo below as a smudge of smoke on the hill (to the upper left of the sign). Update: There is no sign of the fire today (May 28, 2005). We are getting more thunderstorms today, and it was cloudy when I was taking photos of Desert Ironwoods, making their pale purple flowers appear grayish in the photographs. May is supposed to be sunny!